Oregon lowered ticket prices by more 34 percent this year, including a $500 reduction in the lower half of the 100 level, and added single-game tickets for $10. Oregon also provided free shuttles to games and offered season parking passes for $50 to $100. A 34% cut in the price, and, using the midpoint method, an increase in the Qd of (6770-6209)/((1/2)(6770+6209)) = 8.6%. So the elasticity of demand is about 0.25. You don’t have to have passed microeconomic principles to understand that this price cut is going to reduce ticket revenue below last year’s dismal $2.6M. And rumor has it that AAD Eric Roedl has realized he can’t squeeze ASUO for more student money either. Oregon’s 2014-15 attendance was the worst in Matthew Knight Arena history and the lowest overall numbers for Oregon since 1992. It was a 20 percent decline from the prior season and well below the arena-high 8,018 fans per game posted in the 2010-11 season, the first year Matthew Knight Arena opened. 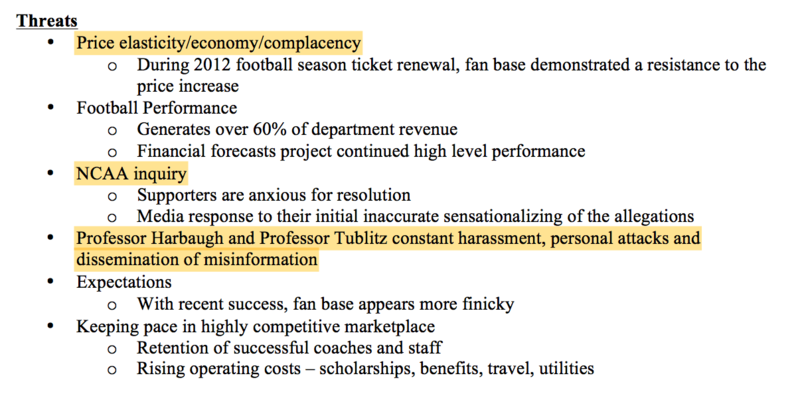 In response to an Oregonian/OregonLive article this winter detailing Oregon’s falling attendance, fans outlined reasons they stayed away last season. Parking, availability of games on TV and the fallout from the previous summer’s sexual assault accusations were recurring themes. Oregon responded to the poor 2014-15 numbers by dropping ticket prices, creating new ticket promotions and generally bettering the fan experience inside the arena. And the numbers returned to normal — with the help of a terrific on-the-court product put on by the Dana Altman-led team. It was a nice bounce-back year, Pintens said. But it’s not good enough. Not yet. Fill it up at any price? That’s going to require Dana Altman paying our students to show up and watch him coach. Of course Altman’s got the money – at least until his players figure out how to break the NCAA cartel and get their cut. That news is four years old. The question is: Can UOM maintain that status with current content?